Sony has confirmed that customers waiting for back orders of its highly anticipated NEX-7 compact system camera will be fulfilled in the next three weeks. Speaking at a launch event for a new range of compact cameras, Sony UK's Paul Genge told TechRadar that a shipment of NEX-7 cameras had arrived in the UK, and he was expecting that all orders would be filled within two weeks, with a maximum waiting time of three weeks. 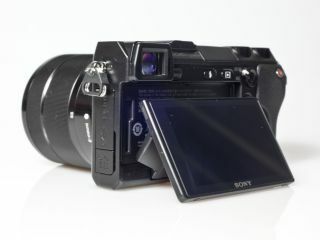 The NEX-7 was launched last August, with an original anticipated release date of around November. However, the factory which produces the cameras in Thailand was hit by the devastating floods affecting the area, seriously affecting production. At the time of its launch, it was one of the most advanced CSCs on the market, but in the intervening time other competitors, such as the Olympus OM-D E-M5, Fujifilm X Pro1 and the Pentax K-01 have been launched. Asked whether these new competitors worried him, Genge said that the NEX-7 still led the way in terms of specs. The NEX-7 features a 24.3 million pixel rear-illuminated APS-C sized CMOS sensor. One of the most expensive CSCs at the time of launch, it retails for around £1000 (body only), or £1,130 with the attached kit lens. Price-wise it is now cheaper than some of its competitors.